. The map is used by campus faculty, staff, students, and visitors and includes buildings, parking and transit system information. Beginning this summer, we started work on incorporating live GPS tracking of our campus buses into the map. Both the idea and GPS application on the buses came from one of our computer science students who wanted more information on the campus transit system. mobile version of our map for use on smartphones. After showing it to my users, one of the first responses I got was, "Are you going to make this available as an application?". After spending many hours developing a feature-rich mobile web version, the thought of investing a large amount of time to code the same experience on multiple platforms was overwhelming. Then I began thinking of the maintenance headaches; even simple changes, such as adding a new sets of icons for custom markers, would be time consuming. All of a sudden the idea sounded much less appealing. I'd spent all this time on the mobile web version of my map, why couldn't I just use that? So instead of writing the maps application using the SDK of each phone platform, I wrapped my v3 Maps API site into a WebView inside a stub application. Now all the work spent on the web version automatically applies to the "native" application and my users never even know the difference. The Google Maps API team have even provided some great reference articles for Android and iPhone which help get the process started. I was initially skeptical of the usefulness of such a project. The mobile version of the map offers users the same functionality that they can get by simply bookmarking the map in their browser. So I was very pleasantly surprised at the both the usage and publicity the application has garnered. Within the first two weeks, the iPhone application was downloaded 1,200 times and the Android application almost 200 times. Both applications are receiving very positive reviews. We consider this project a huge success. Going forward it will now be a priority to make sure new features work well both on the desktop as well as on mobile devices wherever possible. Over the last couple of years, my office has been working on using the Google Maps API to display the Missouri State University campus map. The map is used by campus faculty, staff, students, and visitors and includes buildings, parking and transit system information. Beginning this summer, we started work on incorporating live GPS tracking of our campus buses into the map. Both the idea and GPS application on the buses came from one of our computer science students who wanted more information on the campus transit system. In November I traveled to Europe and was fortunate enough to meet many developers at the Google Developer Days in Prague and Moscow. One aspect of the Qualified Developer program that really resounded with folks was its community focus. Google has long held to the wisdom of the masses, and I knew when we began the program that no one person or even one company would be sufficient to evaluate developers by themselves. I'm happy to report that in the past few months Qualified Developer Proctors from the community have held sole responsibility in evaluating application submissions, evidence of community participation, and requests for professional references that are the cornerstone of the Qualified Developer certification process. With their help, we can accept people into the program much more quickly than before. We've also had our fair share of Fast Track qualification candidates. This program was announced a few months ago, and has enabled several developers to be recognized on the basis of work already familiar to Google or their developer community. Through the Fast Track process we are able to pay close personal attention to recommended developers to ensure that they receive the recognition they deserve and become qualified as quickly as possible, generally within a week. Just before the end of the year, we launched our new Developer Directory. While we will continue to recognize accomplished companies who choose to advertise in the Solutions Marketplace, we're very excited to be able to show off our Qualified Developers on this new website, which has also been updated to better convey the benefits of hiring a Qualified Developer. Currently we are in the process of piloting certifications for several new APIs. We are building out certifications for KML, Google Earth Enterprise, and 3D in preparation for our first master certification, the Google Qualified Geo Web Developer. We're also working on certifications for the AJAX Search API, Enterprise Apps, and Android. So if you haven't already, come over to Google Code and Get Qualified! After a crazy year end and new beginning, I wanted to give you an update on the Google Qualified Developer Program. You can use up to 5 different icons on a single map, each of which can be used for multiple markers, so come rain or shine you can always take the weather with you. For more details check out the Static Maps v2 API Developer's Guide, and be sure to post any feedback on the Google Maps API Google Group. P.S. Oh, and one more thing. Requests made to the Static Maps API v2 no longer need a Maps API key. For Australia Day this year I took a trip with some friends to the beautiful city of Melbourne, Australia. World renowned for the arts, world class sporting events, and a relaxed cafe culture, it's also well known for what Wikipedia tactfully calls "its changeable weather conditions". Or, as Crowded House described it, "Four Seasons in One Day". This being the case, it's always good to check the weather forecast, and no weather forecast is complete without a map. Now if you're looking for an interactive map, you are spoilt for choice, but if you would prefer a simple static map to print out or view on your phone it's not so easy. Weather maps need weather symbols, and until now the only choices for marker icons on Static Maps have been the regular Google Maps pins. are just days away and the city of Vancouver glitters in festivity. Its nightly sky has been adorned with 20 robotic searchlights thanks to Rafael Lozano-Hemmer at “Vectorial Elevation” powered by Google Maps and Google Earth APIs. It is an interactive artwork that allows users to direct powerful light beams and transform Vancouver’s skyline between February 4 - 28, 2010. 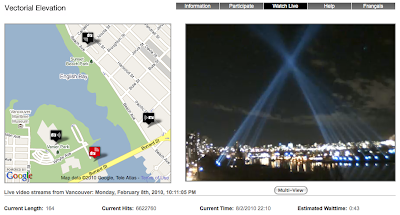 Using a custom interface built on Google Earth and Map APIs, the web site Vectorial Vancouver lets participants design huge light sculptures by directing 20 robotic searchlights located around English Bay. Users submit designs together with name, location and dedication or comments. Every night from dusk to dawn new designs are quietly rendered sequentially as they are added to a queue. The project automatically creates a personal webpage for each participant, documenting his or her contribution with views from 4 project webcams. With a 15 Km visibility radius, the installation intends to blend the virtual space of the Internet with one of the most emblematic public spaces in Vancouver (see live view snapshot). Find out more on the Google Blog about Google's other offerings like Street View snowmobile for fans of the Games. Or personalize your own Vancouver nightly skyline and let your imaginations and Olympic spirits soar! Opening ceremonies for the 2010 Winter Olympics are just days away and the city of Vancouver glitters in festivity. Its nightly sky has been adorned with 20 robotic searchlights thanks to Rafael Lozano-Hemmer at “Vectorial Elevation” powered by Google Maps and Google Earth APIs.